There is nothing worse then having to pack and unpack huge and heavy mats ever time you want to do some training. It is even worse when those same mats come apart while you are training. Apart from the convenience it is also dangerous are your toes can get caught between the gaps which can lead to strains and broken bones. This is why interlocking gym mats are such a great option. These mats are also referred to as jigsaw mats and foam mats. Interlocking mats are great for a number of reasons and you are sure to experience the benefits once you have tried them. Easy to assemble – The interlocking nature of the mats make them very easy to assemble. Just like a jigsaw puzzle the pieces fit snuggly into one another forming a perfectly smooth surface. The mats can then be easily taken apart when they are no longer in use. Easy Storage – These mats are incredibly easy to store. As they are only 1m x 1m they cab be stacked up when they are not in use. And as they are light weight you don’t have to worry about them toppling over and injuring someone. Light Weight – There mats are very light weight. 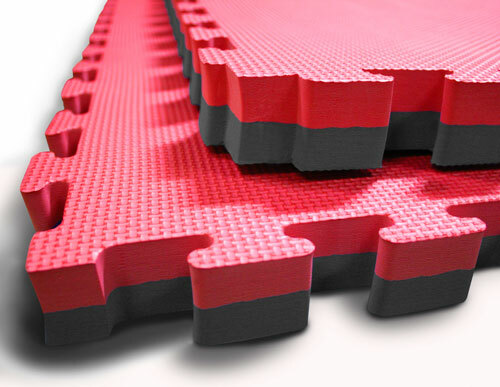 Each mats weights only 1.5 – 3kgs depending on the thickness. This is extremely light when you take into consideration the size of each mats. So if you are looking to buy a good gym mat for your training area look no further then EVA interlocking gym mats. They are a great solution for any train area.